The first area of the park after the munched motorhome display (check out part 6 if you want to see a picture) is the donkey exhibit. The map calls them American Burros. This, I suppose, is in contrast to Mexican burros, which I love, especially with shredded beef and red chile sauce, but American burros are just donkeys. It’s a strange way to start, although I suppose if you’re going to show donkeys at a wild animal park, the best place to put them is at the beginning. They’re certainly not going to provide the big finish. 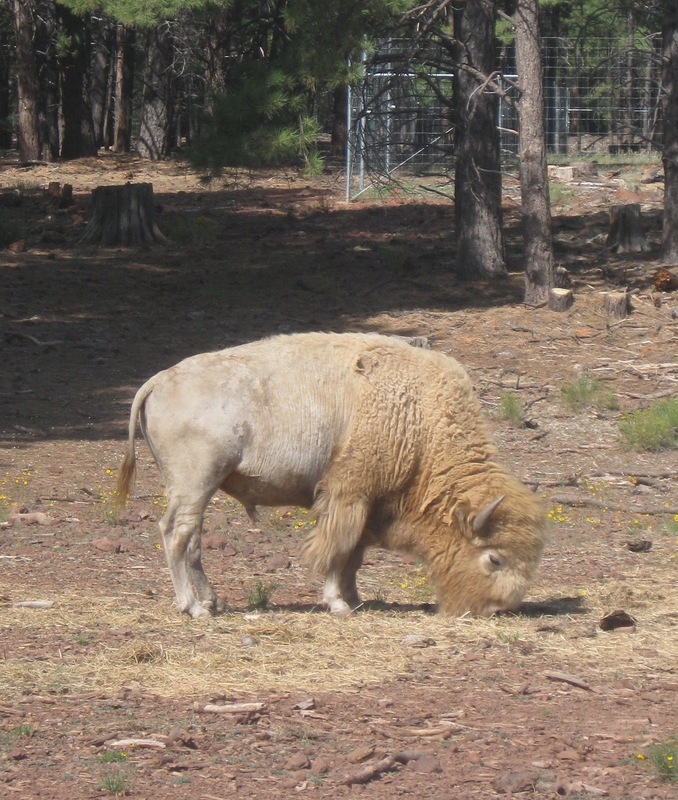 At Bearizona, there were maybe ten of them spread around randomly over the wide, bare ground of their enclosure, standing under pine trees or just out in the open. Even they seemed confused as to why they were there. We drove slowly through the large pen, searching for any sign of interesting behavior, or even movement. One kind of twitched his ear, and then another lazily bent his neck to look in our direction. He began to saunter towards us, and I got the feeling he might be coming over to bum a cigarette. Sensing our non-smoker aura, he changed direction at the last moment and shuffled past us, meandering slowly along the road, eventually stopping and standing in another part of the pen. That was exciting. We moved on. Donkeys in their natural habitat. I think there are four of them in this picture. The next exhibit was bison. I love bison. They are unequivocally my favorite North American mammal. 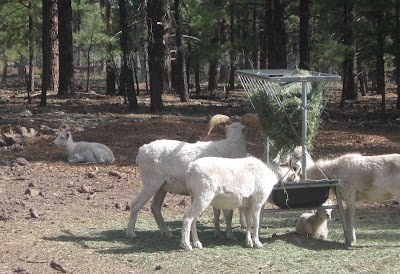 I love their massive, shaggy, triangular heads with their scraggly goatees, and thick, stubby horns. Above the hips, they look like furry Marines, with thick necks, immense chests, enormous shoulders, and torsos which narrow sharply to a trim, dare I say positively svelte, waist. Yet from the waist back, it’s as though God slapped an average cow’s rear end onto this monumental beast. Granted, a cow that spends a lot of time at the gym doing squats, but a cow nonetheless. This almost comical combination makes them look as though they’re always on the verge of tipping forward onto their broad, flat heads, leaving their little back legs wiggling helplessly in the air. It’s an image that makes you want to laugh, but you quickly suppress the urge, because bison look as though they’re just waiting for you to give them a reason to turn you into mulch. Inside the bison exhibit, we pulled the car far onto the shoulder and stopped. 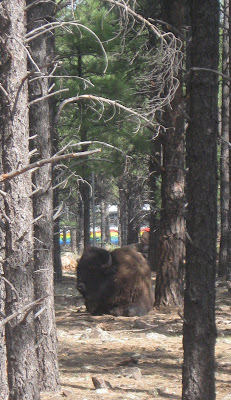 On one side of the road was a solitary male, a big bull bison. He was standing between some trees, coolly regarding our Sportage. They were roughly equivalent in size. On the other side, but further back from the road, almost to the back fence, was a loose conglomeration of five or six more, including another massive male. The rest appeared to be females, or younger males. They weren’t doing much beyond swooshing their tails occasionally. 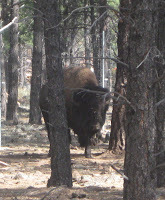 I turned back to watch the lone bison because he was closer, and I could see him clearly through my open window. I just sat there, absorbed by his majestically majestic majesty with a reverence that bordered on adoration. Unlike donkeys, bison are just naturally interesting to watch. I could watch bison all day, even when they’re not doing much, which is most of the time. When I come within visual range of a bison, especially one of the really large, alpha bulls, I feel like a star-struck boy in the presence of a legendary sports figure: entranced by every tiny movement, awed by mere proximity. I see myself sitting in a booth at a 50’s soda shop, a red ballcap with a big “B” cocked on my messy-haired head, my chin resting on my cupped hands as I stare all moony-eyed at the furry behemoth across from me, who has one front leg thrown casually over the back of the seat, and the other curled around a frosty milkshake. He is perfectly relaxed, placidly aware that everyone around him is basking in his natural radiance, and not annoyed or insecure in the least with the attention. He’s looking out the window of the shop, watching the street scene beyond with calm detachment. Mr. Bison nods in acknowledgement, an easy and benevolent smile momentarily crossing his face. I am encouraged by his positive reaction. 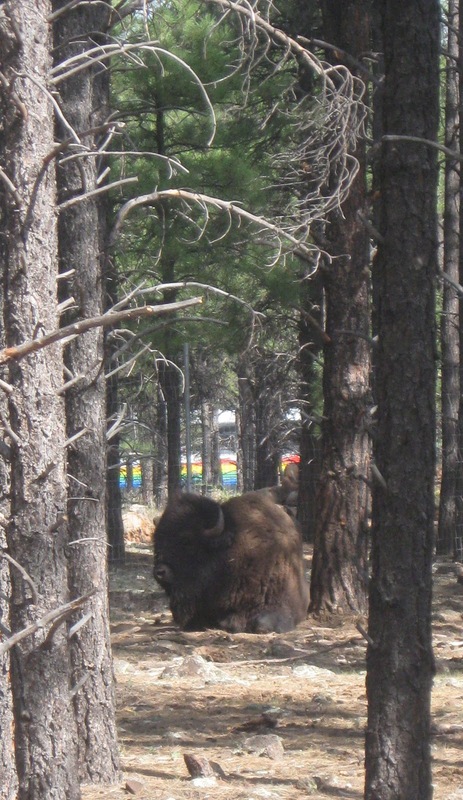 Mr. Bison’s gaze moves slowly from the world outside the window to me, massive brown head pivoting evenly like the door of a bank vault. The hoof that’s hanging over the side of the booth moves towards his mouth, a vaguely apologetic expression letting me know he’d like to answer the question, but he’s still chewing something. Mr. Bison ignores my indiscretion, and his gaze recedes to the window. I just sit and watch him chew his cud, endlessly fascinated by the mechanical working of his jaw, lost in wonder. Unfortunately, no one else in the car seemed to be as enthralled by the bison as I was, and it wasn’t long before the squawking and squabbling from the back seat dragged me unceremoniously through my personal wormhole of space and time, and back to reality. This could have made me angry, being deprived of a rare opportunity to spend time observing bison from such a close range; but oddly, I felt no animosity as we moved back onto the road and pulled in behind the line of cars waiting to get into the next exhibit. I pleased myself with the notion that maybe the peaceful power of the bison was rubbing off on me. Three or four cars in front of us were waiting to enter the wolf area. Even though there was plenty of room to go around, no one broke from the line. Our view was blocked, but it was obvious that whatever was drawing attention in there must be just on the other side of the fence. I wondered aloud how they could just leave the gates open between the wolf exhibit and the connecting ones. We all agreed it was a worthy question, and we closely examined the area surrounding the threshold. We drove over a slightly raised metal platform, which was constructed of round, evenly-spaced bars. In between the bars ran strands of thick wire. It appeared to be some kind of an electrified cattle-guard. That explained it. Still, the span of the platform didn’t seem all that wide, maybe twelve feet, fifteen? How far could a highly-motivated wolf jump, anyway? What if you gave him a running start? I hoped the Bearizona people didn’t wake up one day to the aftermath of a massacre. “Sorry, Sweetie,” I replied, dutifully rolling up the windows. Once we finally nudged our way into the wolf exhibit, it was easy to see why the cars had been lingering. On the right side of the road, less than a telephone pole away, was a large pile of rocks. These were real rocks, not the fake, sprayed-concrete-over-wrecked-RV ones. Scattered on the rocks were six or seven wolves. My brain took a sudden right turn. What a great name for a mixed drink! I could picture myself, or maybe someone a lot tougher than me, going up to a bartender and saying, “Give me a wolf pack, on the rocks.” Clint Eastwood could pull it off, with his signature clenched teeth hiss. A ‘wolf pack’ would have to be one hard-core drink. I imagined it consisting of equal parts Stolichnaya (for the Russian wolves), Crown Royal (for the Canadians), and Everclear (for the good old American ones), plus maybe just a splash of funny car fuel for kick. Pour it in a Thirstbuster 32 oz. cup, slide in a steak tartar shish-kabob swizzle stick, add the ice, and OW-OOOOOH! You’ve got yourself a wolf pack! Imagine being attacked by one of those. Just remember to stay away from open flames before, during, and especially after, when it’s coming back up. The wolf pack on the rocks before us, however, expressed no immediate interest in attacking anything. The wolves were tucked in amongst the pile, all preoccupied with various stages of napping, snoozing and sleeping. Because of the way they were nestled in the rocks, and the way the rocks tended to jut out sharply in many places, the wolves were difficult to see, except when you were directly in front of them. That’s why the line was moving so slowly. Finally, we got our chance to assume the prime viewing spot. I became excited. I asked Elizabeth for the camera, and pulled as far over as I could. I flipped on the hazard lights, to let the people behind me know that if they weren’t willing to wait, they should seriously consider going around. We were going to be awhile. I had always wanted a good, clean head shot of a wolf, and I didn’t know if I would ever get a better opportunity. I took the camera in hand, and began composing the shot. It was more difficult than that, though, because the rock pile was on the passenger side of the car, so I had to shoot around the seats and the door posts and through the closed windows of the other side. In addition, only one of the wolves actually had his head up, and even that one’s eyes were closed, as though it were doing some kind of Zen meditation thing. Which was fine, but the way its head happened to be positioned, it was partially obstructed by the rock in front of it. I sat there, trying to stay locked in on that wolf, waiting for it to turn just enough, while also dodging Maria’s bobbing head because we had let her out of her car seat, and now she was jumping up and down on it. A sudden knock on the window caught us all by surprise. I turned to see a park worker standing outside the car next to me. He said something I couldn’t hear. I pointed to my ear to let him know I couldn’t hear him. He looked around both sides of the car quickly and repeated himself, much louder, but I still couldn’t make out what he was saying. “He said to roll your window down,” Elizabeth informed me. “Don’t do it, Dad!” Jessica yelled from the back, sounding panicked. “I have to, Jess. It’s okay, this man works for the park. I’m sure it’s safe.” I began to roll the window down. Jessica clutched her pillow and covered her head. Maria squealed with delight. “Is there a problem?” the man said in a clipped voice. He was dressed in a brown uniform, and resembled a cross between a park ranger and a UPS driver. Even with the dark sunglasses he was wearing, he still somehow looked nervous. “No, no problem,” I said. “Well,” I began to confess, “I am having a hard time getting a good picture of that wolf over there.” I held up the camera in one hand and jerked my other thumb over my right shoulder, towards the meditating wolf. Had his eyes opened? “You have your hazard lights on,” the man continued flatly, abruptly rising up onto his toes and craning his head to look over the top of the car. His face stared at me with what seemed to be barely restrained patience. “Except the rule in the park is that you only use your hazard lights if you’re having some kind of difficulty with your vehicle, to let us know that you’re in need of assistance.” He stepped back suddenly, and peered cautiously under the car, and then to the right and left, before popping back up. “That was in the rules, Dad,” I heard Jessica’s muffled voice say. “So you’re not having any trouble with your car?” He twisted quickly, as though he saw something peripherally behind him. “No, sir, everything’s okay here,” I said, shaking my head. “And you don’t need any assistance?” Because of the sunglasses, I couldn’t tell for sure, but it felt like he wasn’t even directly himself to me anymore. “No. I’m sorry.” Through my voice and expression, I tried to emphasize how chastened I felt. “Then please turn off the hazard lights, and please remember to only use them if you are actually having a problem with your car.” His tone was a mix of official reprimand and pleading. Without waiting for a response, he backed away from our car carefully, scanning omnidirectionally with each step. With an abrupt half-leap, he was back inside a modified golf cart, which kicked up a trail of dust as it sped towards the gate at the other end of the exhibit. I looked over at Elizabeth, who did not look pleased. “Roll your window up, Daddy!” Jessica yelled from under her pillow. “Oh, right.” I rolled the window back up. I looked back to the rock pile, but the wolf was gone. I exhaled a disappointed grunt. Setting the camera down, I put the car in gear and we began moving. “You still have your hazard lights on,” Elizabeth said, her face illuminated by a superior smirk. After the wolves came the Dall Sheep, which are not native to Arizona, but come instead from the far north, places like Canada and Alaska. They basically resemble whitened versions of the Bighorn Sheep that do live here. They were feeding from what looked like two bicycle racks placed back to back, with tubular steel slats creating a vertical holder for the hay that was stuffed in between. Several years ago, we had been fortunate enough to drive an RV around Alaska, and had seen many Dall Sheep, usually standing on large rocks or clinging somehow to the sides of cliffs in various places along the way. It was weird to see them standing on the flat, brown, bare ground, like the donkeys. The exhibit contained no rocks of any size. The fake Bighorn at the entrance had a manufactured mountain to stand on, but not these living beauties. What's a sheep gotta do to get some rocks in this joint? What rocks happened to be there were so small they could easily be stepped over. I thought of the sheep competing with each other for the opportunity to stand on such pitiful rocks. I imagined a full-grown Dall sheep proudly raising his head and displaying his noble, curled horns, while trying to keep all four legs planted on a wobbling rock the size of a cowpie. It just didn’t seem right, and frankly was a little depressing. It was like having a chance to see Michael Jordan in his prime, and then watch him do nothing but layups. I pulled out the map to check. Interestingly, the map showed the brown bison and the white bison sharing this exhibit space. Something must have happened. 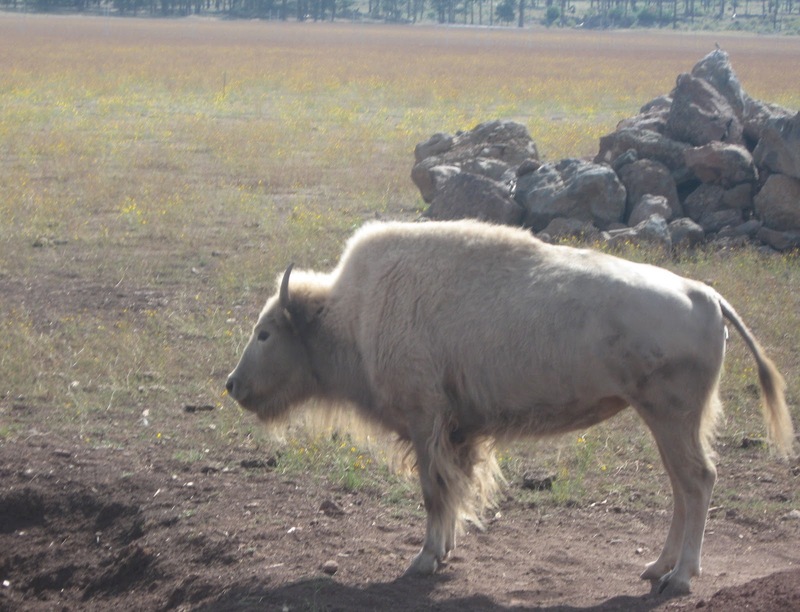 Were brown and white bison fundamentally incompatible? Was it a racial thing, or was it something more mundane? I guess it’s true, I thought as we passed through the vastness of the white bison’s home, blondes do get preferential treatment. That’s why they have more fun. I thought of those poor, brunette bison confined to their pen. They didn’t have a meadow to run around in. I turned to Elizabeth. “I’m sorry,” I said apologetically. She regarded me quizzically, but remained silent. I guess some things you just don’t want to know. On the far side of the exhibit, across the road, a construction crew worked on a faux rock display. I wondered how many RV’s were in there. None of them were visible, since it had already been sprayed over and painted. Only a few steel support poles could be seen rising from the ground and disappearing into the structure. At least the Bighorns have a place to climb. Our collective attention was quickly drawn to the steadily approaching gate ahead of us, where a small wood building and a park worker stood, advising each carload of people one last time on the guidelines before entering the bear enclosure. “Don’t get uptight,” I replied. “I think the man at the gate wants to tell us a few things. The worker reminded us of the rules we needed to follow, and informed us of the existence of two loops within the exhibit designed to provide closer views of the bears. He ended with, “Do not feed the bears, and keep your windows rolled up at all times.” He leaned hard on the word ‘all.’ I thanked the man, and began to inch forward to the gate. Wordlessly, I held the switch until the windows shut tightly. We bumped over the electrified cattle guard, and entered the realm of the bear. Whew! 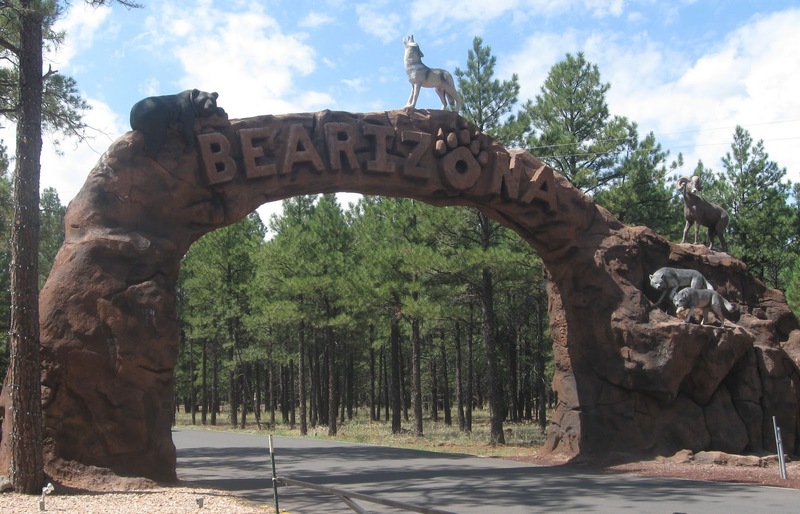 We got to everything at Bearizona…except the bears, which will be the focus of part 8, yes 8, of the continually lengthening adventure of Uncle Day Weekend. Trust me, I want to finish this as much as you do. free standing toilet paper holder - thank you for you comment, and thanks for reminding me we need one of those for our hall bathroom! The one we had completely fell apart a few weeks ago, no kidding!